This article was originally published on the Huffington Postwebsite on 19th March 2014. Pope Francis has been making an extraordinary impact within and beyond the Catholic Church. 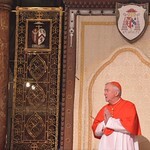 His direct and forceful challenge to reform and reinvigorate the Church has already begun to bear fruit. He has also had a tough message for business. Consistently he demands a serious re-examination of purpose, and calls for higher standards. In the Catholic Church he has no time for an inward-looking mentality, reminding Catholics that the Church does not exist for its own sake, but to proclaim the Gospel and serve humanity, upholding human dignity and promoting the common good. This raises three questions: Is the Pope anti-business? Is he simply preaching without making any practical contribution? Is his passionate call for change something that business wants to engage with in a practical way? Second, he is not simply preaching without offering a viable route to practical action. He is drawing on a developing tradition of Catholic social thought which offers a rich ethical framework for social and business enterprise, expressing universal principles shared by many of different religions and of none. He is offering this as a significant guide to practical action. Many of those ideas, translated and adapted to be immediately accessible to many, have now been set out in the framework called a ‘Blueprint for Better Business?’ which also featured last month at Davos. This initiative directly addresses the challenge of making human dignity and the common good the fundamental parameters for defining the purpose of any business. At the same time it recognises personal accountability, relating these principles to the experience of those who make the practical decisions needed to keep a business true to its purpose. Is the agenda put forward by Pope Francis something that business wants and can engage with in a practical way? Yes. In fact the origin of the ‘Blueprint for better Business?’ initiative was the concern of business leaders that the problem of restoring trust between business and society could not be solved by business alone. They looked to an accessible wisdom in the way these challenges are addressed in faith traditions, coming to see that a point of reference beyond the market was vital in helping to reconnect business with society. Trusted relationships grow when people come together with a shared purpose and common commitment. Listening to these business leaders and working with them I have become convinced that a key to lasting change is for any business to define and express its clear guiding purpose which is shared by all in the enterprise and against which they are willing to be measured. This fundamental requirement is not antipathetic to profit as a purpose driven business will deliver a fair return for responsible investors through activities which themselves respect human dignity and serve the common good. The core purpose of a business needs to be specific enough to enable the company leadership to direct its activities to producing goods that are truly good, services that truly serve, and acting deliberately over time not only to minimise harm but to enhance the broader wellbeing of all those it touches. It was the willingness of business to engage with this initiative that has allowed the development, in the ‘Blueprint’ initiative, of five principles of a purpose-driven business. From my own discussions with business leaders it is clear that the ‘Blueprint’ principles work in practice as businesses seek greater employee engagement and customer loyalty. I hear evidence of courageous decisions based on purpose, such as withdrawing from profitably selling products that are not consistent with that fundamental purpose, and innovating to replace those with profitable products that are. Clearly investors need to see such decisions as contributing to sustainable performance and they need to avoid the risk of over reliance on short term metrics to make long term investment decisions. We need to move beyond tinkering. There needs to be demonstrable change, driven by a sense of urgency, establishing clear purpose, founded on human dignity and the common good, inspiring people to come together (as employees, customers, suppliers and investors) for the benefit of both business and the society that allows the business to operate, thrive and create wealth. But this is not a quick fix. It is a journey that will take many years.